Midvale is not characteristically known for its dining options, yet Chabaar Beyond Thai has earned a solid fan base. They boast a “something for everyone” menu, and omnivores, vegetarians and vegans love Chabaar’s wide selection and friendly service. In particular, Chabaar Beyond Thai offers inventive and delicious vegan dishes. The Vegan Thai Omelet is a unique dish made from rice flour, and is surprisingly eggy. A touch of turmeric gives the omelet its vibrant yellow hue. Gently folded over a combination of crunchy deep fried tofu cubes, sauteed tofu and tasty roasted peanuts, this dish is quite tasty. Paired with a sweet chili sauce and veggie accoutrements, each forkful has distinct flavors. Combining flavors and toppings is one of the joys of Thai food, and this omelet is a good example. Another Thai dish that encourages flavor experimentation is the Joke. In the vegan version, a savory rice porridge is topped with cubes of tofu, thin slices of carrot, ginger, mushrooms, green onion, celery and cilantro. A tiny jar of pickled jalapenos is served alongside, allowing the diner to create different flavors in each bite. The Joke comes to the table in an impressive, gigantic white bowl and it’s enough food for three people. Using flaxseed to replace egg, the waffles at Chabaar are a rare vegan treat. The waffle’s crisp exterior has a light and fluffy middle and is topped with bananas, peaches or berries. Each forkful of the waffle was sublime – a great way to start a day. You can also order a crepe served in the same fashion. Chabaar Beyond Thai also serves a variety of vegan dishes for lunch and dinner. Anny Sooksri, owner of Chabbar, Tea Rose Diner and Siam Noodle Bar, has a flair for vegan food. She loves to please her customers by creating innovative, mouthwatering fare. They even have vegan cookies for sale at the counter! 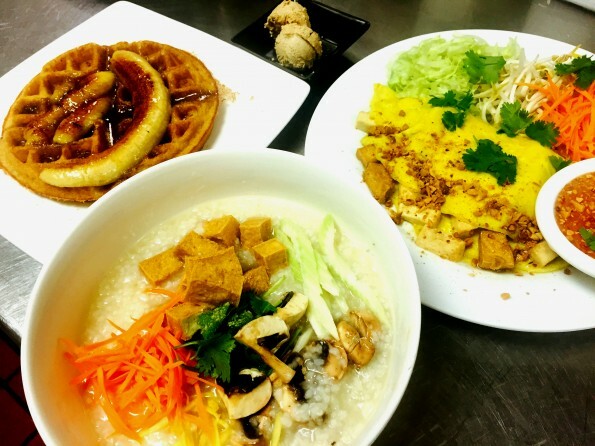 Vegan dining options have multiplied in Utah’s urban areas, and Chabaar Beyond Thai is a shining example of why the Salt Lake Valley is a great place to enjoy vegan food. Chabaar Beyond Thai is at 87 West 7200 South. Hours are Mon-Thu 7am – 9pm, Fri-Sat 7am-10pm, Sun 8am – 9 pm.